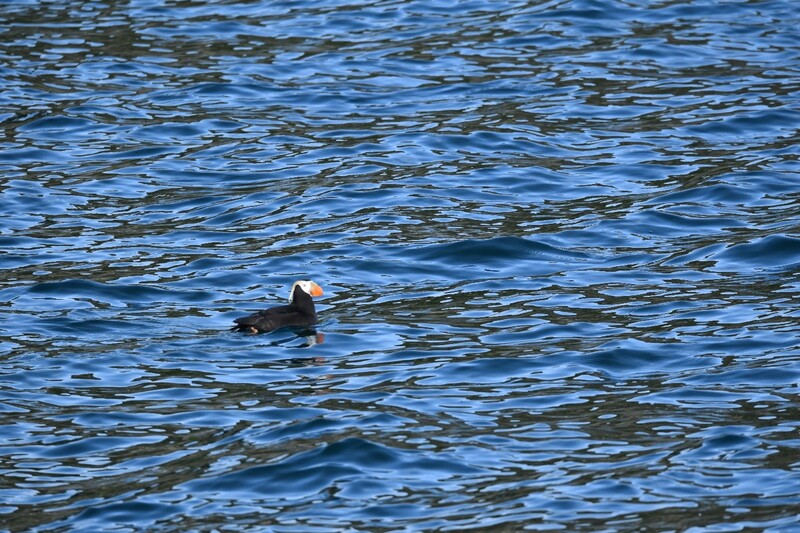 A tufted puffin showing off its bright colors and elegant wings. 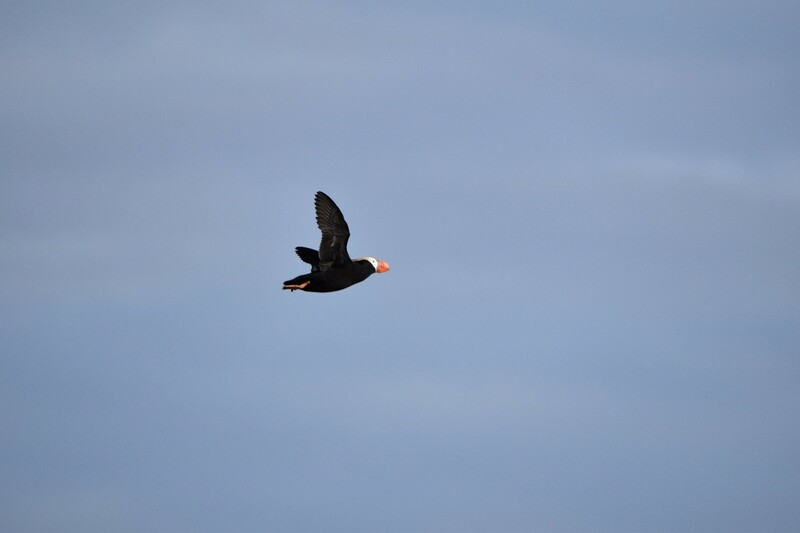 A puffin in flight near the Inian Islands. 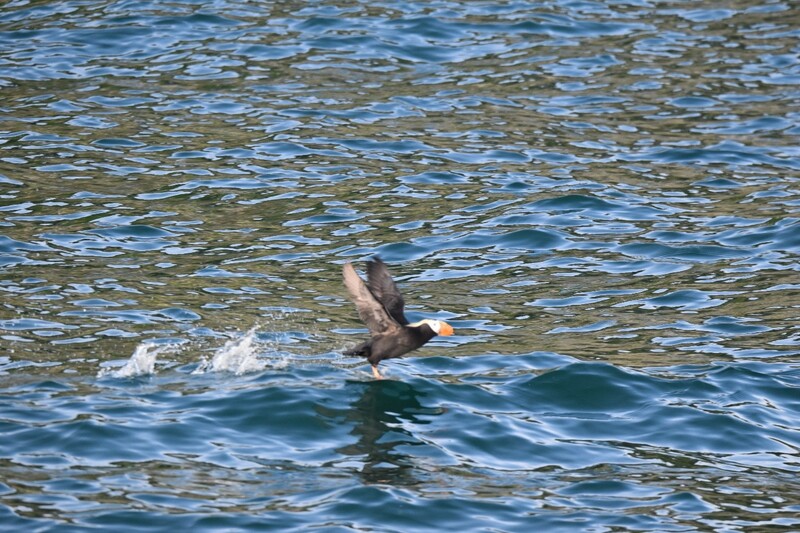 Tufted puffins like this one have deep bills that can hold up to 20 fish at once. 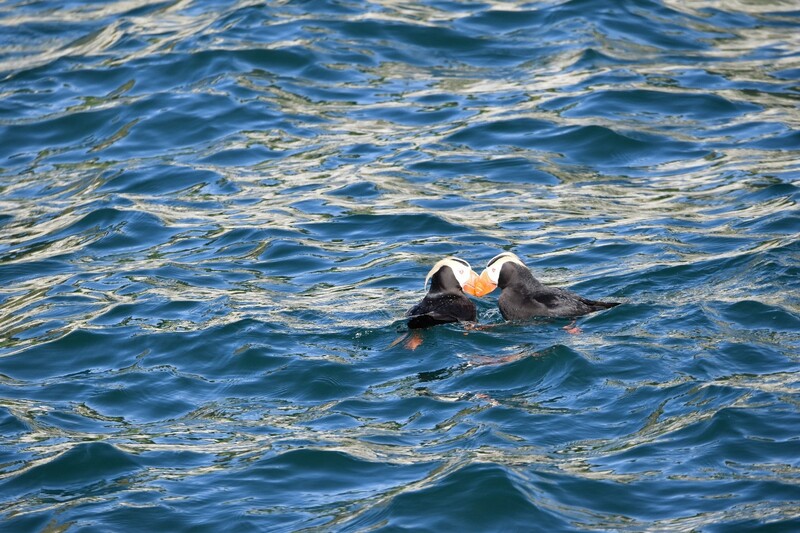 Tufted puffins dive deep in the water to get fish to eat. 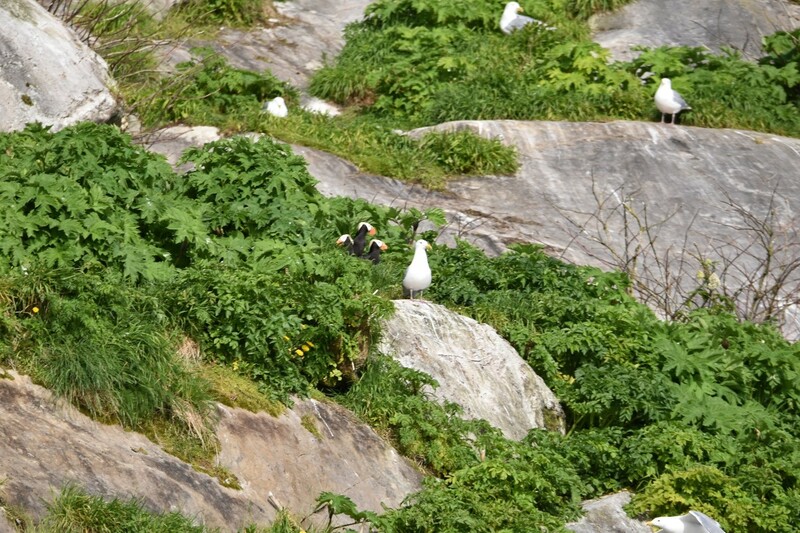 Puffins like to live in burrows near the edges of cliffs. 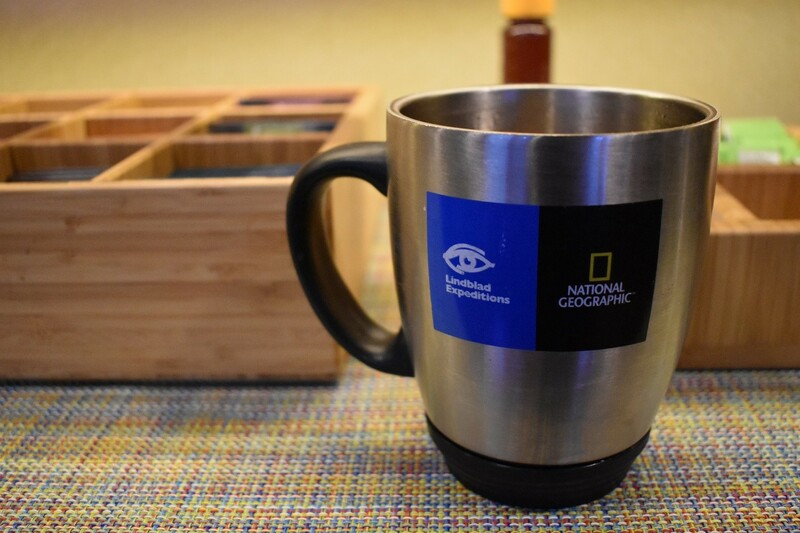 In honor of World Oceans Day on June 8, 2018, Lindblad Expeditions announced that they are eliminating single-use plastics on their fleet of cruise ships around the world. And they already have cut back on single-use plastics on their ships. They use reusable mugs instead of coffee cups with plastic lids. 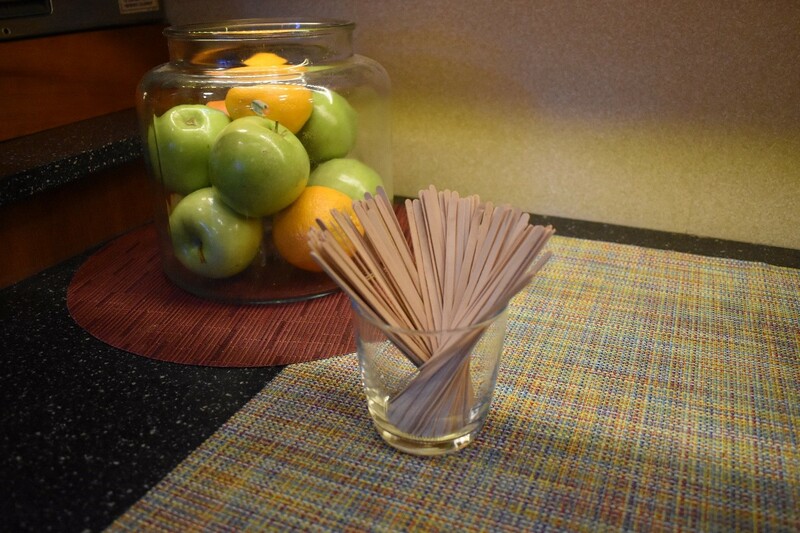 Lindblad Expeditions also uses wooden stirrers instead of plastic ones. Even the pens onboard are largely made of cardboard instead of 100% plastic. 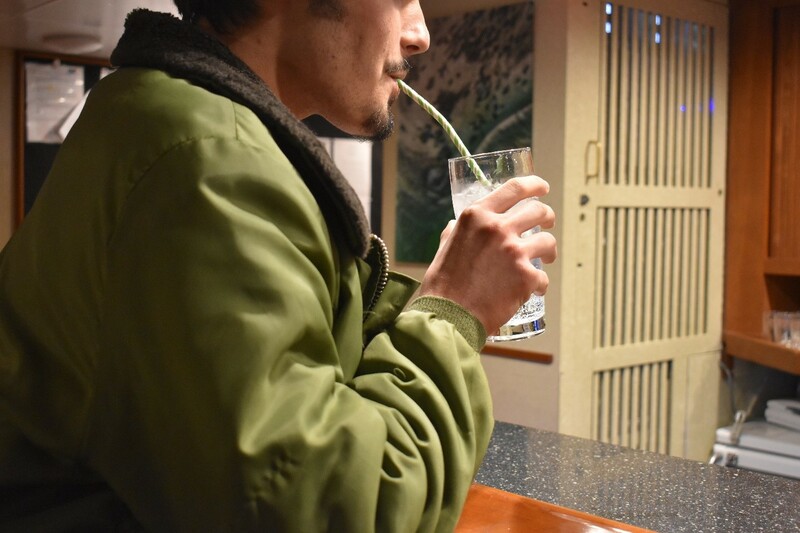 Lindblad Expeditions is also switching to paper straws on their ships. 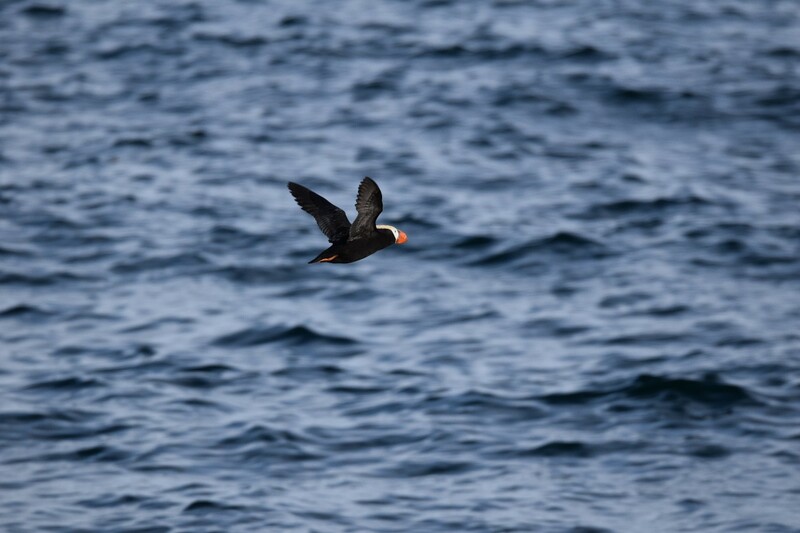 These measures may be small, but they will help contribute to an ongoing effort to eliminate plastic waste and keep the puffins flying high. Alaska was truly breathtaking. Glass-like bits of ice floated in untouched waters in Glacier Bay National Park. Sea lions basked in the sun on the rocks of the Inian Islands. In flying over Petersburg in a four-person plane, I saw glacial waters of the purest blue. It almost seemed unnatural. I’m not exactly an optimist when it comes to climate change, but in seeing Alaska, I can attest that we do have something beautiful that is definitely worth protecting. While Alaska is one of the least-inhabited places in the United States, it is still impacted significantly by humans. According to the National Climate Assessment, Alaska has warmed more than twice as quickly as the rest of the United States. A recent study from the Alaska Marine Science Symposium suggests this might not be the only way humans are harming the 49th state. Arctic birds such as the tufted puffin have been found to have plastics in their stomachs. A study done in the Aleutian Islands in Southwest Alaska found that around 20 percent had some sort of organic material in their stomachs. Because the Aleutian Islands are protected like the islands of Southeast Alaska, Tlingit tribe members in Southeast Alaska are conducting their own screenings for plastics. 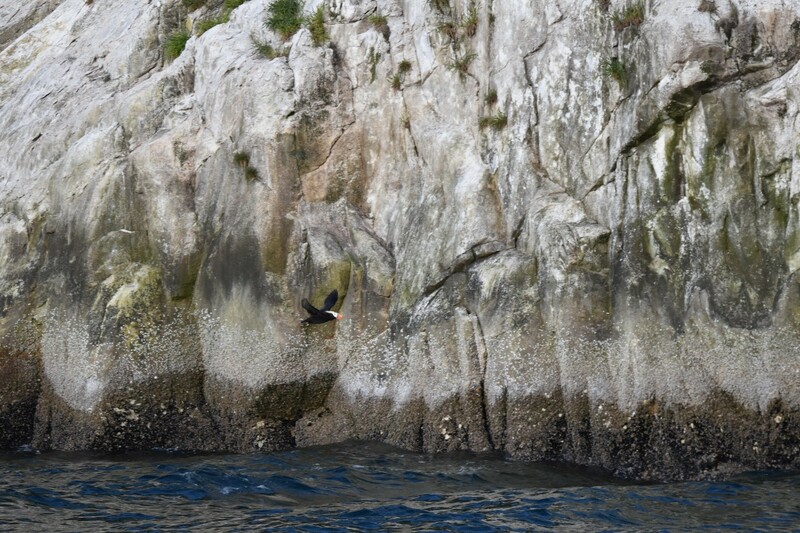 One would never guess the presence of plastics by watching the puffins fly around, and one might not even find large bits of plastic in the puffin’s habitat. The trouble for puffins isn’t the plastic you can see, but the kind that is too small for the human eye. Microplastics are a huge concern for marine life around the world. These plastics are by definition smaller than the eye can see, and they can take several different forms. Some microplastics come from bigger pieces of plastic that break apart and disintegrate into much smaller pieces. Microbeads are intentionally added to products like soaps, scrubs, and nail polish and are used as glitter or an exfoliant. Microfibers come from clothes that we wash in a washing machine. Washing one fleece jacket can release 100,000 microfibers into the ocean. Microplastics make their way up the food chain easily. Smaller marine animals mistake plastic for plankton and try to hunt it down. When these smaller fish are consumed by birds and bigger fish that humans like to eat, the plastic makes its way up the food chain. The pollution in Alaska isn’t quite as bad as the pollution from plastics in other parts of the world, but because so much of Alaska is covered by National Parks and Marine Protected Areas, it is surprising that these areas are not free of microplastics. Because plastic pollution is a prevalent issue for marine ecosystems, it is especially important for entities that interact directly with marine ecosystems to be careful with what they are putting in the water. Cruise ships and fishing vessels especially need to take caution, as they typically dump waste directly into the water. In recent years, large cruise companies have begun to pledge to reduce their use of plastic onboard. Lindblad Expeditions, an expedition travel company that works in partnership with National Geographic on ship-based voyages aimed at people who care about the planet, has taken this pledge a step further. On June 8, in honor of World Oceans Day, they announced they have removed all single-use plastics from their fleet. Plastic straws have been replaced with paper ones, and drink stirrers are now made of wood. 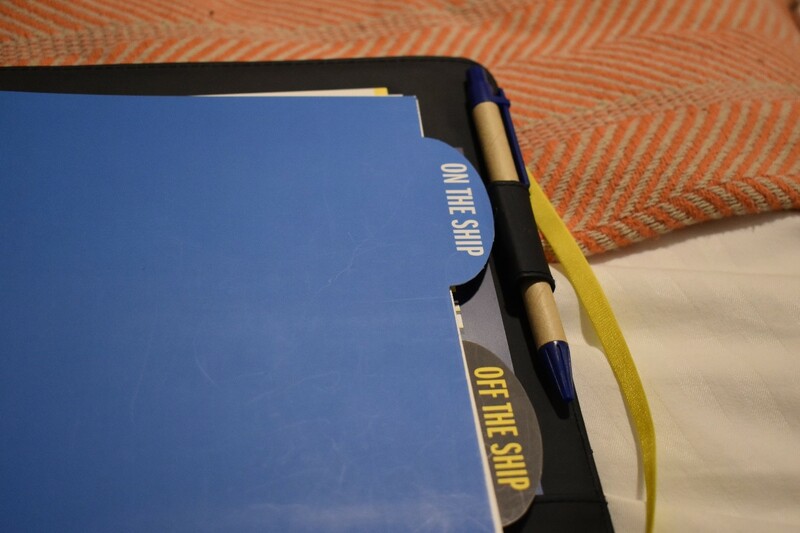 Instead of plastic cups guests are given reusable metal bottles and filtered water, and they have even removed all 100% plastic pens from their ships. Their effort supports partner National Geographic’s Planet or Plastic? campaign. Small steps like this in the right direction can make a significant impact over time. Companies like Lindblad Expeditions that are dedicated to making sustainable choices should help set the precedent for others. If other companies follow suit and continue to pave the way towards a more sustainable future, the puffins just might live to see another day.